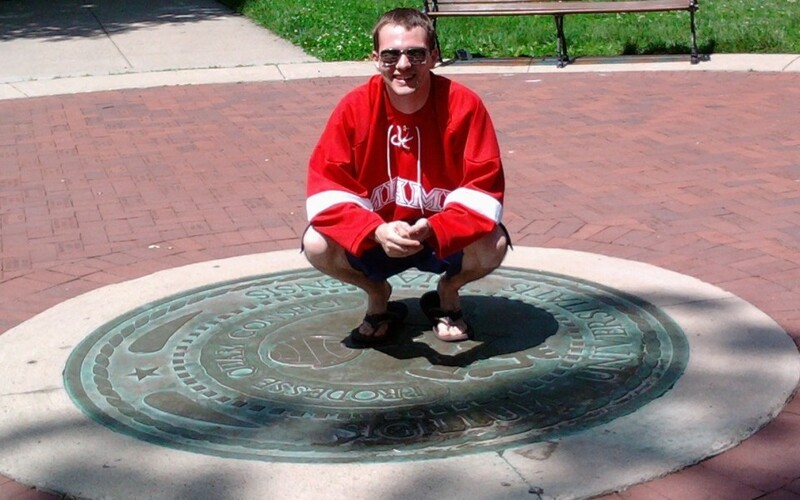 Since the Miami RedHawks are returning to the CCHA Championship in Detroit, I thought I would repost this story I did a few years ago for JRN 350 with Keith O’Brien. Enjoy! What are you willing to do to see a Miami University RedHawk hockey game? Wait on the phone for hours to buy a ticket for a single game before the season even starts? Wait in line for over six hours? How about camp out days in advance in the dead of winter? What helps make the RedHawk Hockey program so dangerous? 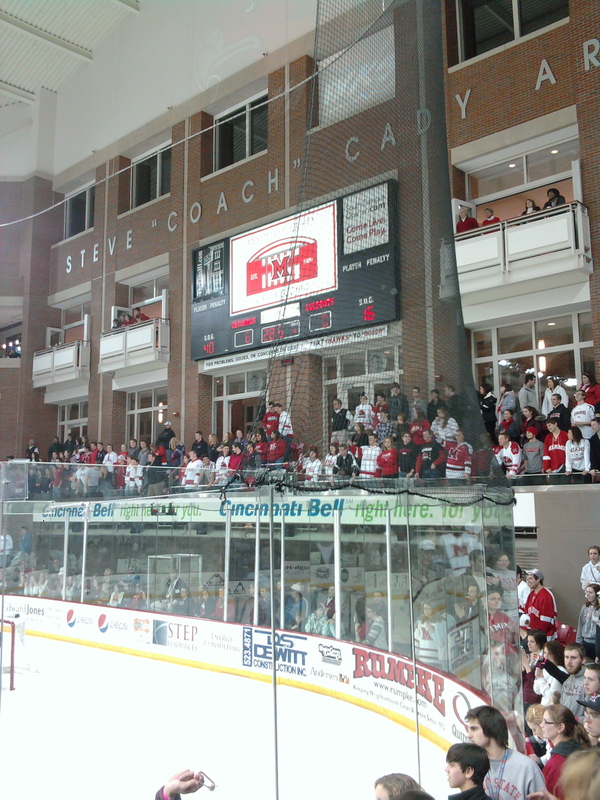 Steve Cady Arena at the Goggin Ice Center is commonly referred to as one of the toughest places to play in the Central Collegiate Hockey Association. Anytime the ‘Hawks are on the ice, fans are stacked up against the glass rooting for a victory. Red Alert is a special student section. Students pay a fee at the start of the year for priority seating at Miami sports events. At Steve Cady Arena, those seats are called, “Ricoville,” after the head hockey coach, Enrico Blasi. Ricoville is elevated seating which allows, not only standing room next to the ice, but fans the ability to lean over for a better view of the action. There are 225 seats in Ricoville and 75 standing room seats. But not all the RedHawk fanatics are in the Red Alert Section. Sophomore Greg Herbert sits in front row near the opponent bench every home game. Herbert is also one of the individuals, famous for camping out before games. Associate Athletic Director Josh Fenton, said the die-hard fans, such as Herbert, helps Miami athletics in two ways. “When you see them camping, you see their devotion. When people who see that, like prospective students on tours, it is a great recruiting tool. Also, it becomes an easier venue to play in for the RedHawks, when the students are at their full potential,” said Fenton. The Goggin Center was opened on October 6, 2006, replacing the Goggin Ice Arena, built in 1976. The nearly $25 million building was built to accommodate the university’s growing love for ice sports. The arena is more then just a single hockey arena. The center has three levels. The mezzanine level holds the press-boxes, four opera style boxes, six private suites, and 102 club seats. It also holds the offices to the varsity hockey and synchronized skating coaches, the assistant athletic director, and building operator. The second sheet of ice is Pad B and constantly in use. It is home to all of the club and intramural broomball games. Broomball is the most popular intramural sport on campus. On Goggin’s intramural website, gogginzone.com, there are over 100 teams listed. It is not unnatural for a hockey or broomball team to have a game that starts at 11:20 pm because of Goggin’s busy schedule. The synchronized skating, Miami club hockey, and Talawanda High School hockey teams both practice there as well. Public skating sessions are held on the Little Ice as well as drop-in hockey sessions. The main ice is the Steve Cady Arena, named for the former head coach of the RedHawks, and current Associate Athletic Director. It holds nearly 3,200 hundred seats. It is the home ice to not only the varsity teams but also community, intramural, and club hockey games. “Goggin is small and the noise is easy to get going,” said Senior David Miller, who is famous for leading chants in the student section. With the students so close to the action, students have an instant impact on the game. Compared to other schools, Goggin is small. With all of Steve Cady, club seats, and the press-box full, Goggin holds about 4,200 people. While, the University of Michigan’s Yost Arena, holds over 6,000 and newly renovated Bowling Green State University’s Ice Arena holds 5,000. President Hodge fields a team called “Roudy Bush,” named after his office located in Roudebush Hall. Also, on the team is Chief McCandless, of MUPD, and Jim McGargish, Program Manager of Goggin. It seems the pulse of Miami can be judge by what is going on at Goggin. The longer the line at Goggin, the louder the cheers and jeers, and the more the teams keep being nationally ranked, the better Miami becomes. That is, as long as the students’ broomball team isn’t playing Team Roudy Bush.